Second chances. Our parents lovingly gave them to us as we learned right from wrong while testing the limits of the boundaries set before us. We grow and learn to make better choices. Some people won’t get second chances unless someone else makes a good choice — in most cases, a stranger. When we opt to be registered as an organ donor upon death, and no longer have need of our organs, we become a potential hero. Huiner is an ambassador for Lifeline of Ohio and has talked with people across Ohio about being an organ donor. Some person whose identity the recipient might never know. Kaitlyn Thompson, of Lifeline of Ohio, explained: “The heroes who register as organ, eye and tissue donors can save eight lives and heal up to 50 more by donating vital organs and tissue.” The organs that can be donated are the heart, lungs, kidneys, liver, pancreas and small bowel. Tissues able to be donated are corneas, bone, fascia, skin, veins, tendons and heart valves. * Doctors and medical professionals won’t do everything to save my life if I’m an organ donor. WRONG: The priority of the medical professionals at the hospital when an injury occurs is to save the patient’s life. A transplant team does not become involved until independent physicians have determined all possible efforts to save the life of the patient have failed and a time of death is announced. Doctors and hospital staff don’t even have access to the registry to see if the patient is a registered donor. * My religion is against donation. WRONG: In fact, all major U.S. religions support donation as the ultimate charitable gift of life and love. Individuals are encouraged to speak with their religious leaders about donation. * I’m too old to donate. WRONG: The truth is, you’re never too old to donate. The oldest donor to date was a 92-year-old who donated his liver to one of the more than 118,500 people waiting in the U.S. for a life-saving transplant. Anyone over the age of 151/2 can be a hero of donation by registering when they obtain/ renew their driver’s license or state I.D. Individuals are encouraged to share their decision to donate with their families so they can help honor the person’s authorization to donate. One of Huiner’s role models is his late daughter, Erika. After a courageous lifelong battle against the ravages of cystic fibrosis, Erika was listed for a transplant and waited three years before receiving two lungs on her 24th birthday. She lived a full and healthy life for nearly four years before dying of a cause unrelated to her transplant. “Erika was not able to donate her organs but was a tissue donor and gave the gift of eyesight by donating her corneas,” he said. Not everyone who needs a transplant gets that second chance. Some die before an organ becomes available. “In a perfect world, everyone who needs a lifesaving transplant should be able to get it. First, however, someone has to say ‘yes’ and sign up to be an organ donor. Everyone deserves that second chance at life,” Don said. You can ask questions and register to be an organ, eye and tissue donor by visiting your local Bureau of Motor Vehicles agency, calling Lifeline of Ohio at 1-800-525-5667 or visiting lifeline ofohio.org. That a nice surprise! 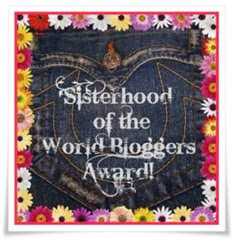 Here are some other blogs worthy of this same award so please check them out.